New tools are entering the market with the intent to make mechanical projects easier and more attainable for auto mechanics and hobbyists alike. Mechanical solutions are not limited to a mechanic shop or garage and can easily be brought to the comfort of the personal garage or space. The tire bead seater is one of those tools essential to growing a tool collection. This item – also called a bead blaster – is a simple and safe tool designed to save time when changing tires by quickly inflating tire sidewalls to seat the bead on the wheel rim. The seater has a valve and rubber coated nozzle, allowing for easy air release and preventing damage to the tire rims. It is able to be used on multiple types of vehicles, including standard cars, trucks, tractors, ATVs, and RVs. For mechanics without access to a tire changer machine it can be a handy alternative. Our top choice for best tire bead seater goes to the Tooluxe 30007L. While several units in our roundup had similar features, the specs on the Tooluxe separated it from the pack. The 30007L boasts a 145 PSI max capacity, which is the largest of our group. In addition to a pressure gauge it also comes with a safety valve to ensure you don’t over fill the tank. The special tip on the end of the Tooluxe bead blaster allows it to seal the beads on the largest sized tires in our review – a whopping 47 inches. That means that if you are going to be working on large truck or tractor tires, the Tooluxe 3007L is the bead seater to have. Owners of the Tooluxe rave about it in online reviews, with 90% giving it either 4 or 5 stars. And given the reasonable price, the Tooluxe 30007L is the bead blaster to beat. 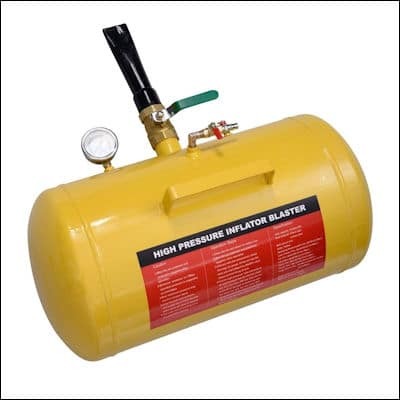 Our second pick for best bead blaster is the ARKSEN 10GAL Bead Seater Inflator. The quality construction of this tire bead seater is evident, making it a worthy entry in our list. The Arksen 10 gallon blaster features all steel construction, which allows it to handle the same 145 PSI max capacity as the Tooluxe bead seater. It also comes with a tough powder coat finish for adds durability and helps resist rust. The business end of the blaster has a lip designed to keep the threaded barrel at just the right angle for air insertion when you seat the bead, and it utilizes a quick release valve to quickly spread the air, letting the Arksen 10 blast the full impact when it discharges air the tire. 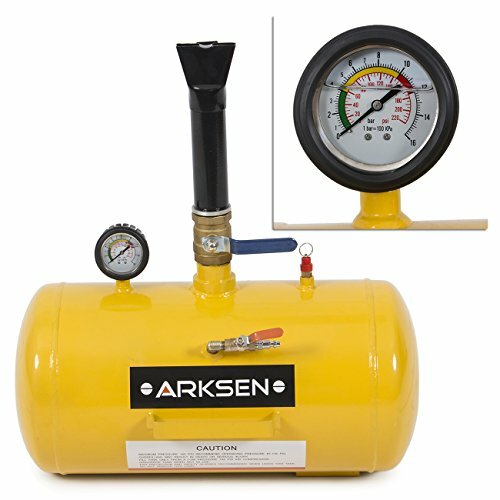 Overall, the Arksen 10 is a quality 10-gallon bead blaster at a good price. The third pick in our review of tire bead seaters is the Mallofusa 10 Gallon Air Tire Bead Seater. 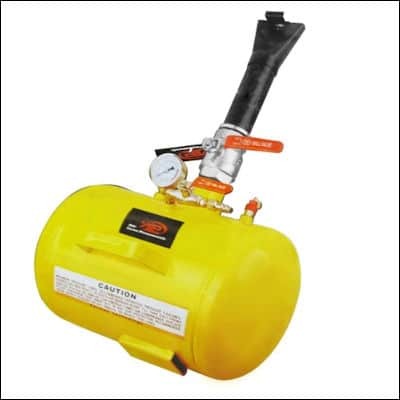 Like our top 2 choices, the Mallofusa unit has a 10-gallon capacity, and can handle a max pressure of 145 PSI. It too is constructed from heavy steel that has been powder coated to resist corrosion, so you can be sure it will hold up over time. Mallofusa added an easy to read pressure gauge for filling, and a safety valve that will prevent you from overfilling the tank to dangerous levels. The working end of the Mallofusa bead blaster has a metal barrel with a specially designed lip. This lip is fashioned to deliver a quick blast of air between your rim and tire at the perfect angle and position to properly seat the bead. For those of you on a budget but looking for a 10-gallon bead seater, the Mallofusa tank comes at a very attractive price. And since over 90% of the reviews online give it 4 or 5-stars, you can be sure of getting a good tire bead seater you can afford. The next bead blaster in our roundup is the Cheetah Model CH-5 Bead Seating Tool. The Cheetah brand is very recognizable when it comes to bead blasters, which typically means that the company puts out good products. And the CH-5 certainly fits the bill as a professional grade tire bead sealer. 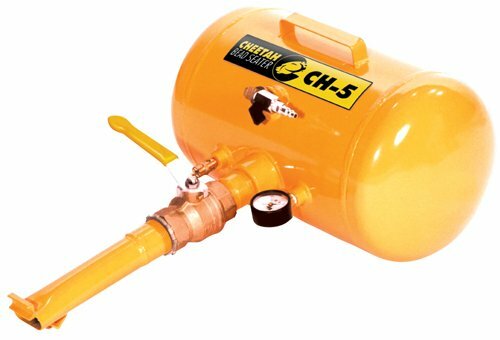 The 5-gallon tank on the CH-5 is ASME-certified, and made from steel with powder coat finish for enhanced durability. It also includes an easy carry handle attached to the tank, which really makes the CH-5 easy to carry around and use. And it also includes mounting feet that make storing the unit simple, while at the same time protecting the barrel assembly from any damage. Despite being only 5 gallons, this small unit is able to handle everything from small 4-inch tires up to 24-1/2 inch truck tires. For most shops that will be more than enough for the types of work they will see. Online reviewers love the CH-5, with 92% giving the bead blaster a 4 or 5-star rating. Words like “awesome”, “excellent”, and “indestructible” are used liberally by owners, which instills confidence in this tire bead seater’s performance. Of course, with a good brand name also comes a higher price, and the CH-5 clocks in as the most expensive in our roundup. But since you frequently get what you pay for, the Cheetah CH-5 would be a great addition to any workshop that appreciates quality tools. 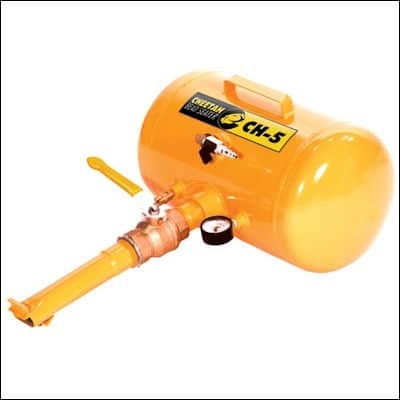 Our fifth pick for top bead blaster is the ARKSEN 5 Gallon Air Bead Seater. 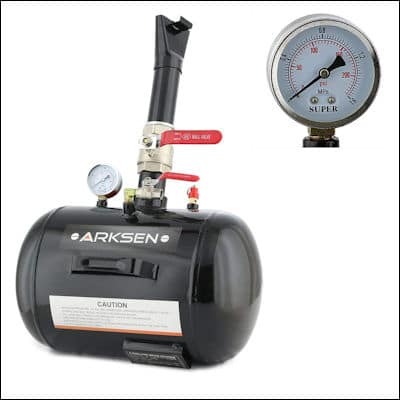 As the name implies, the ARKSEN unit has a 5-gallon capacity, and operates at a pressure range between 87 and 116 PSI. 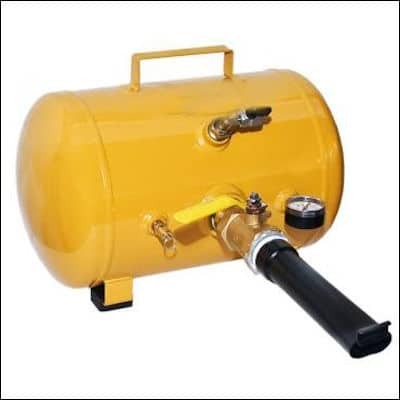 The tank made of solid steel with a tough powder coat finish, and also includes an on/off valve which has the purpose of controlling the filling of tank. There is also an air inlet shutoff valve, to match size of the tire being seated with the quantity of air dispersed, and a pneumatic gauge makes it simple to verify the fill pressure is correct. There are other nice touches on the Arksen, like a handle built in to make for easy carrying and use. And the specially designed lip on the seater makes it simple to seat tires for cars, trucks, atvs, and tractors. A survey of online reviews show over 90% of owners give it a 4 or 5 star grade, which is exceptional for any piece of shop equipment. And since the Arksen has the lowest price among our picks, it definitely is a bargain to consider. Overall Dimension: 17" X 12" X 25"
The final tire bead seater in our group is the XtremepowerUS Bead Seater. Another 5-gallon entry, this tank also features steel construction and powder coating for enhanced durability. It also comes with a carrying handle for portability, and attached feet to keep the unit stable when you put it down. That helps both with storing it when not in use, and also protecting the gauge and other fittings on the tank. Like the other 5-gallon entries in our review, the XtremepowerUS tank is designed to operate at pressures between 87 and 116 PSI, which allows you to seat tires up to 24.5 inches in diameter. As an overseas knock-off of some of the better brands, the XtremepowerUS has most of the features but less of the frills, making it an affordable alternative. 85% of online reviewers give it 4 or 5 stars in their evaluation, so it seems like a good alternative for those wanting to own a tire bead sealer for their home garage without wiping out their tool budget. The operational process is rather simple. 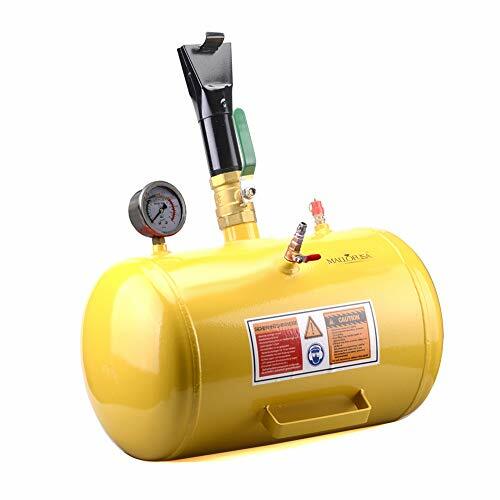 The 5-gallon tank is filled by a standard shop compressor (87-116) PSI. 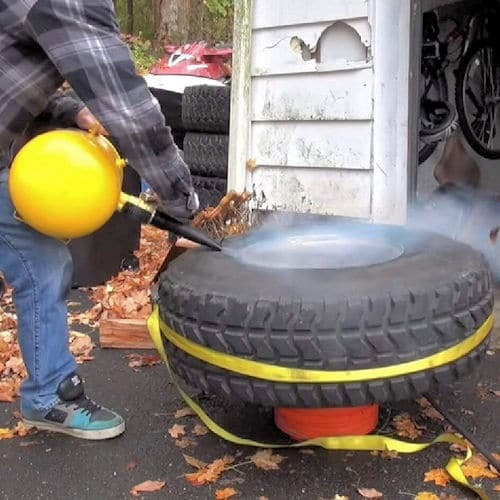 (Note: maximum pressure for the 5-gallon steel tank if 145 PSI). It has a large gauge to provide accurate reading of the current operating pressure. The bead blaster sends the highly pressured air to the tubeless tire, which “seats the beads” of the tire to the wheel assembly. The process takes less than a second for most cars and light trucks. The continual air flow maintains pressure and pushes the tire to inflate correctly. With the long neck attachment, it is easier to achieve the optimal angle between rim and tire. The rubber design also prevents damage to the tire rim during this process. Handling any mechanical tool is less stressful knowing the safety attributes of the item. Operating items with high pressure involved requires a steady hand and keen sense of attention to the pressure gauge. The tire bead seater should be CE approved and constructed from high-quality, durable steel. The final powder coating ensures durability through many usages with no deterioration or rusting. It is a tool able to last long past the initial need for it. 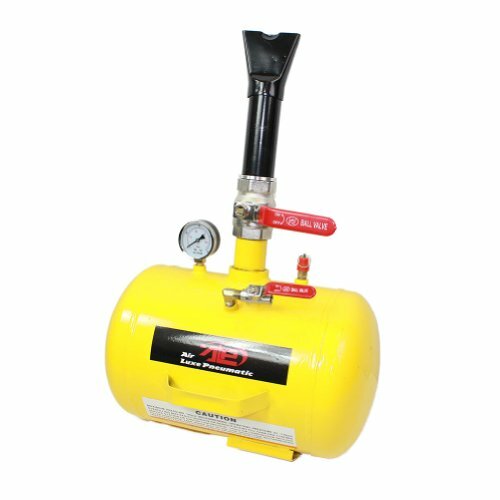 It has an automatic safety valve that naturally opens to release air when unsafe operating pressure is detected. Over-inflated tires will cause the center to wear out and drastically reduce the life of the tire. Over-inflation will also cause loss of traction for the tire. The failsafe is a way to protect from over inflation, pertinent for newcomers to the bead blasting process. The air gauge is also a safety addition found on high-quality tire bead seaters. Monitoring intake volume accurately is visible and easy to track on the large gauge face. The tire bead seater cuts out extra steps in order to create a quick and easy inflation process for tires as needed. Instead of arranging time at a local mechanic shop and shelling out labor costs and more, the tire bead seater brings the process home to the comfort of a personal garage or space. The product is also reasonably priced across various models and tank options and comes with optional manufacturer warranty. The price allows it to be a worthwhile investment, whether used by an avid car enthusiast or a potential newcomer is seeking a learning opportunity. 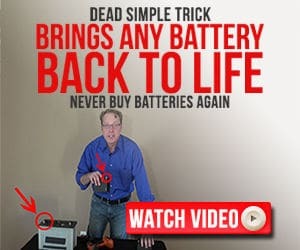 It saves not only time, but ultimately money as well. The design, coupled with the safety features, works to prevent damage to tire rims. Ultimately, the tire bead seater is an essential tool to safely expedite the tire seating process in a manageable way for anyone looking to make a strong investment for their tool collection. While a standard 5-gallon bead seater is typically sufficient, it is limited to 24.5” tires and below. There are other options on the market for those with larger tires and different needs. The 10-gallon tank is suited for up to 47” tires. Just like the 5-gallon version, it can be used on cars, trucks, tractors, ATVs, and RVs. 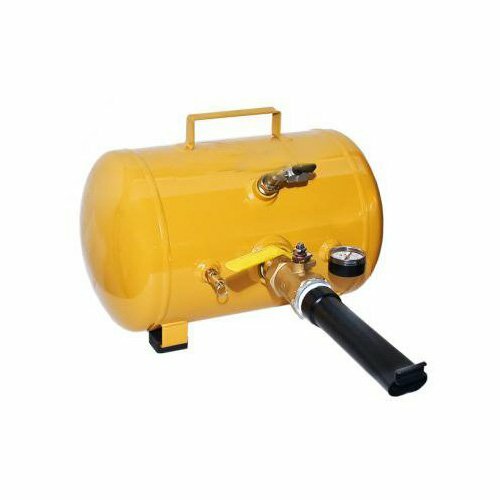 The other features, like the automatic safety valve release and CE approval, come standard for the 5-gallon and 10-gallon tanks. It is important to note the maximum pressure will vary based on tank size. For the 10-gallon tank the maximum pressure is 145 PSI.